Situation A: Several years ago, several Filipino-Chinese brothers and sisters asked me about their eldest brother’s claim that under Chinese custom, only the eldest child is entitled to inherit, with other siblings, especially the sisters, not being entitled to anything. I told these brothers and sisters that since they (and their parents) are Filipino citizens, they are all entitled to inherit from their parents under Article 979 of the New Civil Code of the Philippines. Chinese customs or traditions cannot prevail over the express provisions of Philippine law. Situation B: Jose and Myrna have two legitimate children, A and B. When Myrna died, Jose got married to Susan. Jose and Susan have three children, namely, C, D, and E. When Jose dies, who among his children will inherit? Article 979 is clear that all of Jose’s children (from his marriage to Myrna and his marriage to Susan) will inherit from him. Situation C: When the mother died, the father started dating a younger woman, spending lavishly for her and even giving her the mother’s jewelry. When the children objected, the father said that they do not have any right to inherit yet since he was still alive. The father is wrong. What the children are asking for is their inheritance from their deceased mother. Their right to inherit from their mother began when she died, as provided under Article 777 of the New Civil Code of the Philippines. Art. 777. The rights to the succession are transmitted from the moment of the death of the decedent. Situation D: You are a father or mother and one of your children has led an immoral life or threatened your life. What can you do to prevent this prodigal child from inheriting from you? 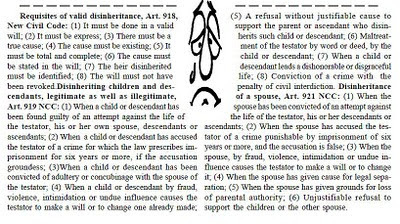 You must execute a last will disinheriting this child based on Article 919 of the New Civil Code of the Philippines. 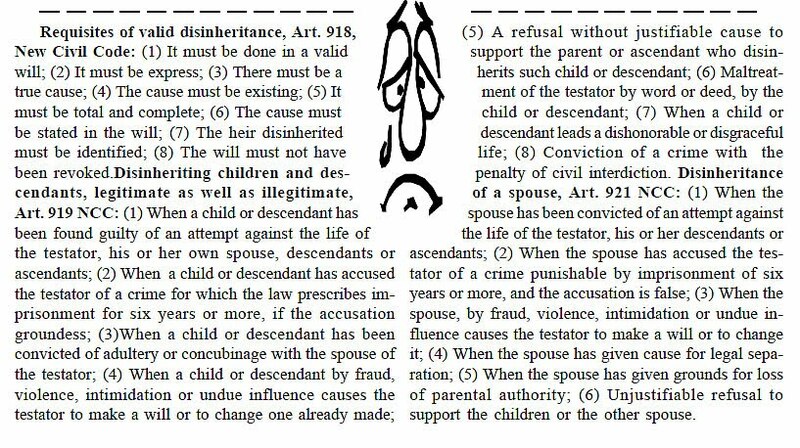 The requirements for a valid disinheritance under Article 918 are very strict (see the graphic below); you must consult a very competent notary public. Please read also the Supreme Court decision in Dy Yieng Sangio vs. Reyes G.R. Nos. 140371-72 November 27, 2006. In this case, the father executed a document entitled “Kasulatan ng Pag-Aalis ng Mana” where he disinherited his oldest child. The Court upheld the disinheritance.